Recomposing the City is honoured to have been awarded a Knowledge Exchange Fellowship, in partnership with John Bingham-Hall of Theatrum Mundi, from TORCH: The Oxford Research Centre in the Humanities. This fellowship provides £10,000 for the joint project Scoring the City, developed by Gascia Ouzounian of Recomposing the City together with TM director John Bingham-Hall. Linking to our ongoing interest in the possibilities of sonic urbanism, this experiment at the intersection takes inspiration from graphic scores in music as dynamic forms that could offer new models for the relationship between architecture, design practices, and social life: in other words, between scoring and performing urban space. Over 12 months we propose to host 4 workshops in very different cities, with common challenges: London and Paris, two global cities needing to create flexible space to accommodate rapid economic and socio-cultural change; and Belfast and Beirut, cities marked by conflict needing to find common spaces across sectarian divides. These will invite architects and composers to collaborate to create scores for sites in transition that challenge the static nature of the architectural blueprint. The process will culminate in a publication of these scores and a launch event. Read more about the project here. Scoring the City follows TM’s collaboration with Recomposing the City on the Beirut-London exchange workshop Urban Soundscape and the Politics of Memory and a subsequent Optophono edition, ‘Acoustic Cities: London & Beirut’ curated by Ouzounian and Bingham-Hall, with support from UCL Institute for Global Prosperity. In October HIVE choir (including Elen Flügge) were featured “Artists in Resonance” for Open House Belfast. They created several site-specific vocal performances for events such as the “Curating Architecture” panel, chaired by Dr. Sarah Lappin, at the MAC; and for sites including the old Belfast Telegraph newspaper print hall, Infinity Farm, and the Great Light. On 11 August, Elen Flügge performed as part of HIVE choir at FRAMEWERK’s Sleepover Event, an all night musical and performance event based in the deconsecrated St. Martin’s church in East Belfast. The sound review “Silent Sonorities and unsound acts” by PhD candidate Elen Flügge was published in Sound Studies Journal. The text “considers the works at two satellite sites of this year’s Sonorities festival, based at SARC in Belfast, UK. The two exhibitions were linked by a focus on practices and forms of listening rather than the presentation of sounding or musical works. Listening is approached as a diversely subjective, shared, guided, uncertain or dangerous activity.” It refers to works by artists including Iris Garrelfs, katrinem, Isobel Anderson, and RTC (Gascia Ouzounian and Sarah Lappin). Dr Sarah Lappin, Prof Gascia Ouzouninan and Conor McCafferty invited papers for the Architectural Humanities Research Association's 15th annual international conference at TU Eindhoven, "Smartness? Between Discourse and Practice." On 15-17 November 2018, Sarah and Conor chaired the session, "Sound and the Smart City: Mapping Sound and Noise" with three remarkable papers from Dietmar Offenhuber (Northeastern University, Boston); William Renel (Royal College of Art, London) and Eric Lewis (McGill University, Montréal). The session emphasised the political complexity of sound in urban space, in defiance of the simplifying and universalising rhetoric of smart city initiatives. All three papers showcased creative and participatory approaches to sound mapping. Offenhuber (with his co-author Sam Auinger), Renel and Lewis all pointed to the rich potential to stimulate participation and citizenship by bringing together practices of sonic arts and design. Dr Sarah Lappin and Alan Jones, President-Elect of the Royal Institute of British Architects, co-cooridinated a two-day workshop at Queen's University: "The Landscape of the Profession" 11-12 October 2018. Guests included Rory Hyde, Curator of Architecture at the Victoria and Albert Museum; Yemi Aladerun, Barbara Weiss Architects and Chris Bryant, Almanac Architects. 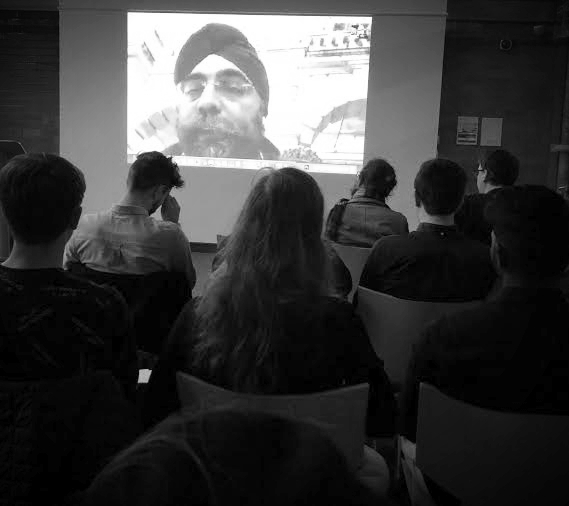 Among multiple other challenges for architects, guests Indy Johar, Sark Matter Laboratories and Elanor Warwick, Clarion Housing both discussed the issue of sound and city planning, particularly in relation to growing urban density and health. Dr Sarah Lappin was invited to chair "Curating Architecture: the Venice BIennale" as part of the Belfast International Arts Festival on 18 October, 2018. Sponsored by the British Council and PLACE Built Environment Centre, the event featured an introduction to the Biennale by Dr Lappin and several presentations from participants in the 2018 Biennale: artist Marcus Taylor, architects Lawrence Lord, Ian McKnight and Alice Casey, architectural historian Gary Boyd and the British Council's Gwen Webber. Dr Lappin chaired a discussion session with the panel and a Q&A session with the audience. In her role as the Chair of the Architectural Humanities Research Association, Dr Sarah Lappin chaired sessions at the 15th annual PhD Symposium at the Alvar Aalto University in Espoo, Helsinki. The event included papers from developing scholars, tours of the internationally-renowned campus by Aalto and keynote by Professor Juhani Pallasmaa. For ten days in October, Dr Sarah Lappin visited 11 schools of architecture and planning in India in Mumbai, Pune, Ahmedabad, Delhi and Chandigarh, including the Centre for Environmental Planning and Technology. the Centre for Heritage Management and the National Institute for Design. In her role as Director of Education for the School of Natural and Built Environment at Queen's, Dr Lappin is investigating possible new research and teaching links with Indian researchers and educators. Acoustic cladding in one of the classrooms by Le Corbusier at the Chandigarh School of Architecture. Photo by Sarah Lappin. In March 2018, Sound | Making | Space co-founder Merijn Royaards and affiliate Christabel Stirling were thrilled to participate in a collaborative research exchange in Beirut, organised in partnership between Recomposing the City and Theatrum Mundi, led by Gascia Ouzounian and John Bingham-Hall. The week-long visit sought to facilitate conversations and connections between sound artists, musicians, architects, urban planners and researchers working on issues of sound and space in Lebanon and the UK. ALTERED STATES 1.5 | CITY OF IMPULSE, an initial follow-up event, builds on some of the ideas and projects conceived in Beirut. 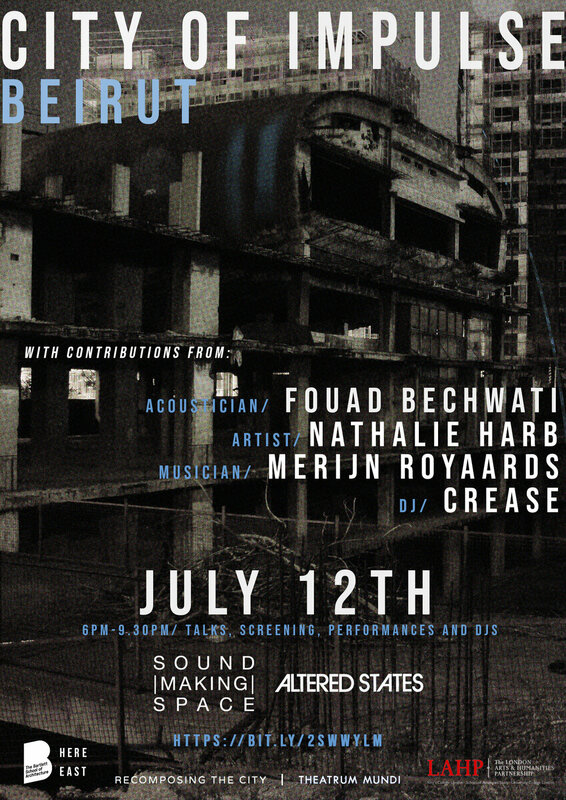 The evening will include talks from acoustician Fouad Bechwati , the mastermind behind 21DB and the sound designer of some of Beirut’s biggest and best night clubs; and sound artist Nathalie Harb, creator of The Silent Room, a sanctuary-like pavilion that provides Beirut residents with access to silence in a chaotic and sometimes sonically overwhelming urban environment. The event will also include a film screening that delves into the ways in which sound figures in questions of landscape and violence, taking a trip through the vernacular acoustic of Beirut wrought by its deserted modernist structures, concrete shells, and cacophonous soundscape of car horns, traffic, construction work and muezzin calls; and a live performance that repurposes this sonic architecture into something altogether new and surprising. The evening will close with DJs and drinks on us!! Watch the trailer for CITY OF IMPULSE here. With special thanks to all of our supporters: Bartlett Doctoral Initiative Fund, London Arts and Humanities Partnership, Recomposing the City, Theatrum Mundi. The Public Co Lab project in Derry/Londonderry has been awarded a Queen's University Excellence in Team Teaching Award. Recomposing the City's Sarah Lappin and Matilde Meireles both contributed to the teaching on the project, and Dr Lappin has shared the work with the public at several invited talks and conferences. Five of the pavilions designed by the Queen's BSc and MArch architecture students were built at full scale and were seen by over 15,000 people over the weekend of 26-27 May 2018 as part of the Void Gallery's "Architecture of Change" programme. Click here for press coverage of the event. RTC associate Dr Matilde Meireles and Dr Diogo Alvim have been awarded first prize for Excellent RC Exposition at the Society for Artistic Research’s General Assembly in Plymouth on 13 April 2018. 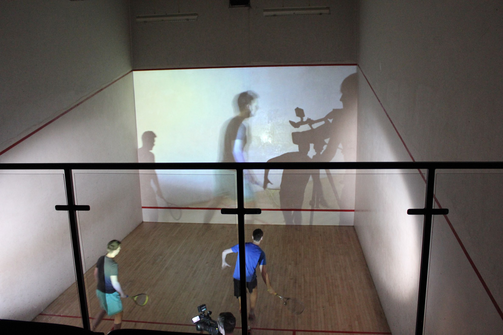 The prize was awarded for their project Trigger Place – A Game of Sound and Architecture. Image credit: Alvim, D. and Meireles, M.
Dr Sarah Lappin and Prof Gascia Ouzounian have been invited to speak at the BOB-MK Urban Design Network at Oxford City Hall on Tuesday 5 June 2018. The event will examine a mix of topics that contribute to the experience of a place, and other speakers include Christopher Martin, Urban Movement; Sue Manley Placemarque; artist Kirsty Brooks and Vanessa Gregory, Look St Albans. The BOB-MK design network has been operating for ten years and is a collaborative group of predominantly local authority officers with an interest in urban design issues. The network promotes the benefits of sharing good practice, ideas and issues, meeting with and learning from peers. The network delivers training, design reviews and urban design events as well as organising educational visits to projects and sites. The BOB-MK network incorporates individuals from a range across urban design disciplines, including many local authority officers from planning, conservation and urban design backgrounds. See http://bobmk.org.uk. Conor McCafferty, a PhD student in the RTC research group has recently been working with PLACE, the Built Environment Centre based in Belfast, as co-producer a podcast titled The Infinite City. Conor is currently working on his PhD thesis with Dr. Ouzounian and Dr. Lappin. Each episode of The Infinite City focuses on one person who takes the listener on a journey through the city, revealing little-known histories, personal memories, and insights into how the city has been shaped. The Infinite City is supported by Feilden Clegg Bradley Studios and Arts & Business Northern Ireland. Dr Sarah Lappin was an invited speaker at the AHRC's The Next Generation Design Research Workshop held at the MAC Belfast, 23 April 2018. The workshop explored the processes involved in applying for an AHRC grant. The event was aimed at researchers looking to secure their first AHRC funding grant and for other researchers interested in learning more about the funding schemes offered by the AHRC. The Acoustic Cities Study Day, hosted by the Faculty of Music, University of Oxford, and co-organised by Recomposing the City, Urban Rhythm Network, and Theatrum Mundi, brought together a diverse group of researchers, practitioners and artists, to critically explore relationships of sound to urban space, and the culture of cities. Contributors and attendees alike battled through driving snow to engage with an ambitious programme that picked out four key themes: the city symphony; sound mapping and acoustic planning; urban rhythms; and situated sonic practice. Our day concluded with an intimate roundtable titled ‘unresolved acoustics’. Presentations, screenings and discussions departed from the premise that we should be more attentive, both in research and practice, to the acoustic legibility of our cities. Architects, designers, urban planners and policymakers take great pains to construct both memorable and readable images of the cityscape, visually ordering our surroundings at the urban scale. Yet, unless it is a noise we dislike, there is a tendency to neglect sound, despite even the most untrained ear being able to distinguish between spaces according to the sounds they produce. Situated within a broader field of music and urban inquiry, in which sound is not assigned to only one discipline, Acoustic Cities thus set out to examine some of the discourses emerging from this very current topic. After a warm welcome, we began in earnest with a brief introduction to the cinematic city symphonies of the 20th Century, given by Professor Laura Marcus, New College, Oxford. Within this genre of avant-garde urban film, the modern city is rendered as protagonist; its architecture, activity and commerce witnessed and described through the pulsating rhythms and movement of metropolitan existence. The skyscraper, lone pedestrian, motor car, arterial highway, pouring rain, surging crowd, shaped though experimental editorial treatment and organised, written and scored like a symphony. A screening of the 5th and 6th ‘movements’ of Lizzie Thynne and Ed Hughes’ Brighton: Symphony of a City (2016) followed. Commissioned for the 50th Brighton Festival, Thynne and Hughes’ original film and accompanying orchestral score is a rare example of a contemporary city symphony that echoes the documentary aesthetic and typical ‘day in the life’ structure of its earlier counterparts, specifically Ruttman and Meisel’s Berlin: Symphony of a Great City (1926). 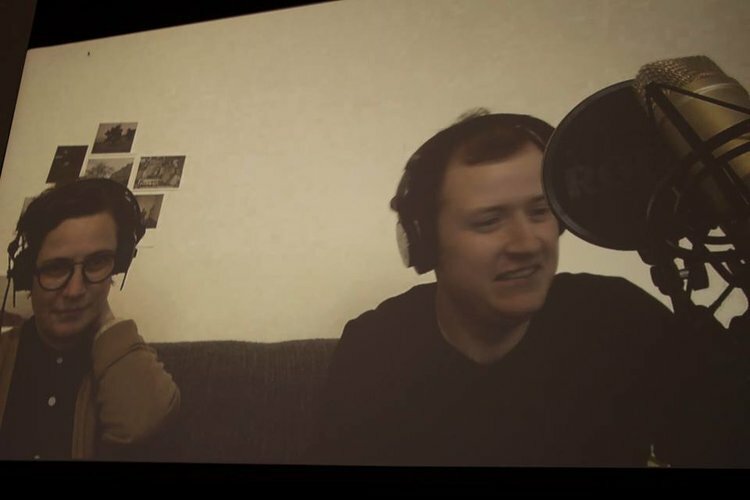 In their presentations, Thynne and Hughes explained how they created tension between musical and visual textures, adopting non-narrative juxtaposition, mimicry and montage, whilst resisting simplistic associations between sound and image. Their portrait of Brighton in film tackled issues such as the privatisation of space, urban erasure, and difficult social commentary. I was particularly moved by the sustained shot of a rough sleeper, his flattened palm tenderly gesturing for small change, hand conducting an anonymous and unrelenting footfall of polished black shoes. The splicing together of archival and contemporary footage of Brighton Rock Pool and Brighton Marina further critiqued the cyclical nature of planning in the city, and the needs of the commission to appeal to both local and wider audiences. Amongst study day attendees, their approach raised questions about the role of sound and nostalgia, how the ‘symphony’ is understood as a unifying model, and inevitable frictions between the old and new ‘score’ for Brighton. The second session took up the subject of sound mapping and acoustic planning. Focusing on the lineage of two distinct models of mapping - noise mapping and sound mapping – Professor Gascia Ouzounian unpacked some of the reasons why sounds heard within the city are so strongly associated with the idea of impairment, and less so with meaningful and positive experiences. Though records exist as far back as Pliny, who commented on the negative impact of noise generated by cataracts of the Nile, it was the industrialisation of cities during the early 20th century, coupled with the professionalization of acoustics that most effectively ‘built sound out’ of the urban realm. In practice today, the emphasis remains fixed on measurable, quantifiable aspects of sound, and urban informatics legislate increasingly ‘sense-less’ environments. Yet the relegation of sound to regulation risks limiting beneficial experiences for the citizen of the acoustic city. Against a trajectory of sonic sanitisation in the professional sphere, both Ouzounian and Dr Lola San Martin’s presentations highlighted a willingness amongst citizens to engage with sound in the built environment as more than a merely unwanted element or bi-product. Strong evidence is provided by online participatory sound mapping projects, which have experienced something of a boom lately; Mapa Sonoru, London Sound Survey and the Montréal Sound Map were all mentioned. Pinpointing individual audible landmarks that collectively (re)compose the complex acoustic profiles of different communities can reveal what we want to listen to, and how we identify with sounds - explored through multilingualism, geography, the landscape or our sonic imagination - that we consider to be of value. Might there also be a genuine fear of losing certain sounds from our everyday soundscapes? Vitally necessary questions must be asked: who is the acoustic city for? Whose environment are we protecting? Connor McCafferty interrogated the techniques of sound mapping further, concentrating on how interdisciplinary, participatory methods go beyond normative urban analysis, and feed into pedagogy and design practices. However, he also drew our attention to some of the problems of web-based sound mapping, including issues of access, authorship, failures of responsibility to participants (for example from loss of data) and lack of critical rubrics for interpretation. This panel showed, amongst other things, that educators, architectural practitioners, policy and planning professionals, share an element of uncertainty about how to deal with the acoustics of the city. Promisingly, a growing number of artistic projects and initiatives across different cities are deliberately building sound back into urban and architectural spaces. These projects, Dr Sarah Lappin insisted, reframe sound as an essential element of place-making, mobility, creativity and connectivity. SAFARI 7 (2009) by SCAPE studio, was just one example given, that demonstrated how acoustic biodiversity fostered creative, positive interactions between people, built environment, flora and fauna of the city in ways useful both to practitioners, but also inhabitants. The urban rhythms of a discordant and avant-garde 20th century Paris, operatic production in post-WWII Venice, and the sonic publics of twenty-first century London were all put under scrutiny by Dr Lola San Martin, Dr Harriet Boyd-Bennett, and Chrissy Stirling respectively. Each of the papers challenged accepted methods adopted by scholars to investigate the complex musical networks of particular cities, at particular historical moments. However, it was the final paper, ‘Voice Memos from the Dance Floor’ that confrontationally and persuasively argued for sound itself to be recognised as a valid research output. If we want to enhance our understanding of the city, its sonic texture and our urban soundscapes this is both crucial and urgent. The ‘voice memos’ played back to us during the session raised numerous questions, such as where and how do we locate practice-led research within current discourse? What is the artistic as well as scholarly potential for this kind of research? How can we effectively mobilise platforms that foreground sound as a rigorous research output? In my opinion, sound as output in musicological, architectural and urban research is absolutely necessary. Positioning the work of sound artists in direct dialogue with architects and planners is one prospective method for generating fresh perspectives on the acoustic city, as well as developing new criteria for the sound of a place. 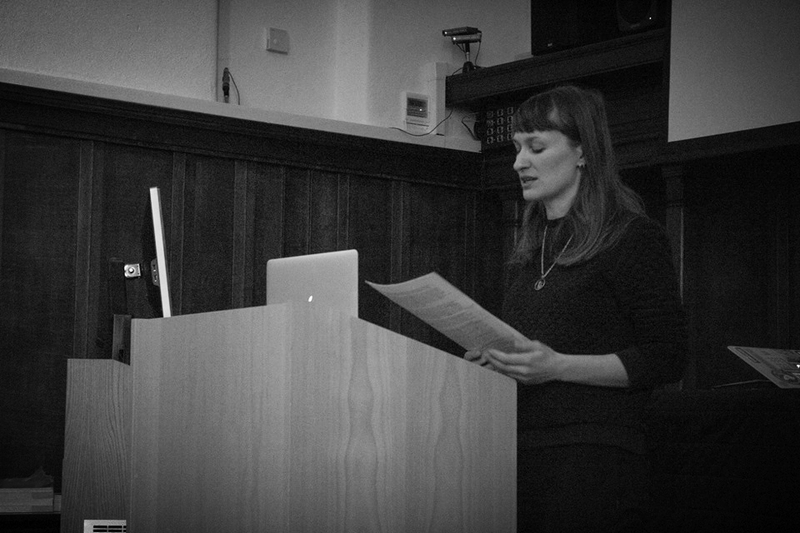 Dr Katarzyna Krakowiak, sound artist, architecture researcher and current artist in residence at St John’s College Oxford, joined Professor Keith Obadike, sound artist & researcher in new media in conversation with Professor Jason Stanyek. We weaved through a number of works by both artists, notably Krakowiak’s architectural ‘listening system’ for the 13th Venice Biennale’s Polish Pavilion, Making the Walls Quake (2013) and the Obadikes’ app-based sound work Compass Song (ongoing and based in New York’s Times Square district). Stanyek’s novel one-word prompts such as ‘skin’, ‘sound’, ‘art’, ‘structure’ and ‘politics’, encouraged a more poetic discussion. Sound is already a space, it is texture, it is also density. Art will make you cry and break your heart. A state of alarm can be caused by silence. The final, perhaps most intimate session of the day began with a conversation between Richard Sennett and John Bingham-Hall, that focused on two ideas within their current research at Theatrum Mundi: the notion of adjacency, and cultural infrastructure in an urban setting. Adjacency was discussed in terms of the unresolved aspects of spaces, which, in turn relate to particular, dynamic urban forms. Within the context of sound (as with dance) a condition of adjacency is akin to an ‘open relationship’, between non-integrated sonic, kinetic and spatial aspects. Adjacency can be considered to underpin a certain ‘authentic’ characteristic acoustic of a place. At the same time, adjacency suggests a malleable transgressive quality, or openness to change. Cultural infrastructure was more speculatively propositioned as a potential means to move past a simply visual reading of value in a place, as a framework that embraces other material qualities, such as sound, or a good acoustic. Specifically, cultural infrastructure provides the means for certain forms of action to occur. In theory, it is the ability to learn from one another in a way that takes difference into account. For example, in an urban context, a thriving community in one city might work ‘because people don’t mind sitting outside, and in another it works because people like to sit on street corners.’ Moving the centre of attention away from the end product (desired acoustic) to its means of action (cultural infrastructure) opens up the possibility for a sonic urbanism developed around a language of value based on the acoustic qualities of space, beyond a noise issue. In relation to both adjacency and cultural infrastructure, we debated the idea that any given place might possess an acoustic ‘authenticity’ that is connected to a particular fixed ‘original’ story of a place. An authentic (rooted) ‘sense of place’ is problematic. How does it allow, for example, new waves of immigration? How does it account for the potential for mobility? On the flip side, great swathes of our cities are packaged up and sold as silent movies, in all their exquisite, noiseless, architectural detail. However, both Sennett and Bingham-Hall were clear in their stance that what we need is to open a city up, open it up sonically to complexity – which means that things are contradictory – that they don’t fit. So, we moved from authenticity to honesty, to the relationship between the score and architecture, and finally out of Denis Arnold Hall - some for a glass of wine, others to face the blizzard outside and journey home, but all left with much to think about. Next week, RTC's Prof. Gascia Ouzounian will be participating in many exiting events in Beirut. 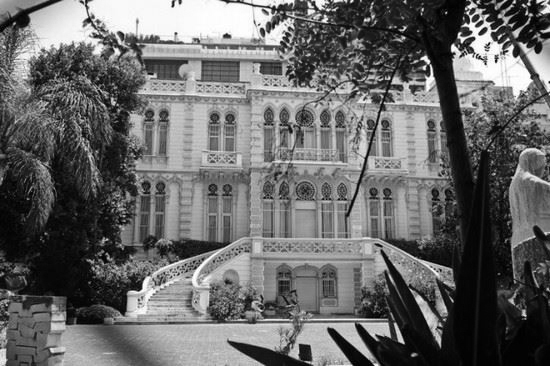 Join Gascia, along with artist Nathalie Harb, Richard Sennett (Theatrum Mundi), and Howayda Al-Harithy (American University of Beirut) for a public talk: Sonic Urbanism at the Sursock Museum on the 23rd March at 7.30pm. Urban Sound and the Politics of Memory is a networking and exchange visit to Beirut organised in partnership between the research groups Recomposing the City and Theatrum Mundi. Can the past be heard in the acoustic ecology of a city? Do the echoes of the past resonate within musical culture, sonic art, and the sounds of public life in streets and buildings? If so, how do practitioners process memory by reshaping the sounds of the city into new forms? During this week long visit we will facilitate opportunities for exchange between practitioners and researchers from Lebanon and the UK, to share understanding of the ways sound art imagines and is shaped by histories inscribed into the fabric of the city. We intend to assemble a small group of musicians, sound artists, urbanists, architects and scholars that will work together to exchange knowledge and practice through a series of activities over 3 days. Many thanks to everybody who joined us for the Acoustic Cities Study Day held at the University of Oxford on March 2nd. This event was co-sponsored by Recomposing the City, Theatrum Mundi, and TORCH Centre for the Humanities at Oxford. ©2018 by recomposing the city.